After so many obvious routes up peaks close to roads, it was time for something different. 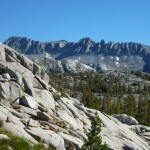 Rodgers, Electra, and Davis are fairly remote peaks between the Ritter range near Mammoth Lakes and Lyell in Yosemite, above the North Fork of the San Joaquin River. Perusing my map, I sketched out the following loop: from Rush Creek, take various trails to Marie Lakes, then go up something on the north side of Rodgers, take the long ridge to Electra, drop through the headwaters of the San Joaquin, climb Davis from the southwest, then pick up the trail again at Davis Lakes. Most things in the area looked class 2-3 in Secor, so I didn’t worry too much about gathering beta, assuming I could figure something out when I got there. I got my usual lazy-alpine start at 6:05, taking the cable car track to cut out a bunch of stupid switchbacks, because I am a bad person. After so many short, easy days I felt full of energy, and jogged most of the flatter trail segments past the enormous man-made Gem and WAAAUGH! Lakes. On the way, I passed a virtual tent city, presumably filled with human cargo carried in a whole 7-8 miles by mule. I blew right by the PCT junction sign, because it is next to the stock crossing rather than the log bridge, and stopped to consult my map when I found myself heading southeast. 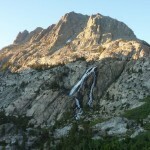 I could have kept going and done my loop in reverse, but I wanted to keep open the option of continuing to Ansel Adams and Foerster, so I retraced my steps and followed the PCT north toward Donahue Pass until I reached the well-signed turnoff to Marie Lakes. The trail petered out in a grassy flat with no lakes in sight, so I decided to head cross-country up the rounded ridge to the left. 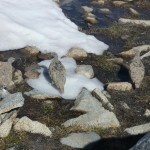 I almost immediately saw a line of ducks, which led me to the remnants of a well-built trail, all that was left of trail 2520 to Marie Lakes. 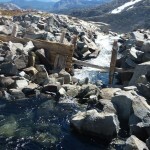 Realizing this reminded me of the Sierra trail network’s decline: it is devolving into a few over-used, mule-ravaged highways and many unmaintained, decaying byways. Hopefully I can find more of the latter before they disappear completely. 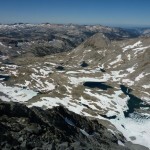 Both lower and upper Marie Lakes are spectacular, and both had substantial snow in them and along their edges. Thanks to my late start, the snow was just soft enough to kick steps with my running shoes, though it fatally loosened the duct tape holding the toes of my shoes together. Much snow-crossing later, I got my first clear sight of Rodgers across an unnamed lake to its north, looking more intimidating than I had hoped. Rodgers is a weird mixture of different types of rock, with areas of white granite, black volcanic rock, and some red, friable stuff. 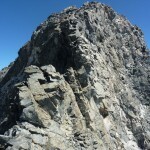 I aimed for some black, loose-looking rock on its northeast ridge, hoping to reach the ridge beyond a tricky-looking bump. After crossing some wretchedly unstable talus, I was surprised to find some delightful class 3 climbing in the black rock. 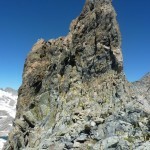 In fact, it is much like the rock in the Minarets, with plenty of loose blocks, but good climbing underneath. 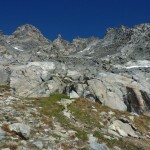 The ridge was narrow and enjoyable, ending abruptly on the white talus-heap leading to the summit, which I reached in 5h30 from the trailhead. I found a mostly-empty bottle of cheap vodka and a register with entries from the 2007 Sierra Challenge participants, among others. I was apparently the first visitor this year. The ridge south got spicy fast the first few hundred yards required class 3-4 downclimbing on black rock with big air on both sides. 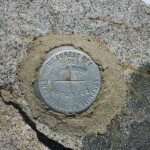 However, the difficulty soon eased up near an old Yosemite boundary marker. Other than one more reddish 4th class section, most of the ridge is highly-variable talus, growing more pleasant toward the southern end. 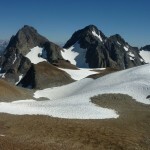 Midway between Rodgers and Electra, the ridge crosses an unnamed peak higher than Electra by several hundred feet, with no register or cairn. While the traverse worked, I would not recommend it. I reached Electra 7 hours out, and found nothing but a business card from 2010 in the register box. 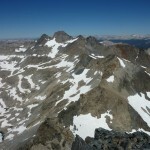 I descended the east ridge, then dropped north, moving onto snow when the angle became manageable. 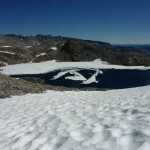 Even with some suncups, the snow was preferable to the rock beneath it, and I boot-skied in a descending traverse to the northeast, aiming for the lakes at the head of the San Joaquin. This turned out to be the wrong thing to do. 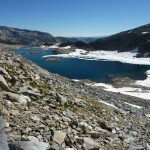 Had I stayed south, I would have reached the closer lake on class 2 rock and snow. 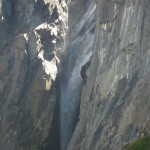 Farther north, I found myself on a cliff next to a waterfall. Not wanting to traverse around to the south, I found a loose 3rd class ledge descending around a corner to the north. Though it looked like I might get cliffed out at any moment, the ledge went with some careful climbing, depositing me on truly wretched talus. I half crab-walked my way over to some snow, and finally reached the lake. Davis looked intimidatingly steep from here, presenting a mixture of loose chutes and steep faces. 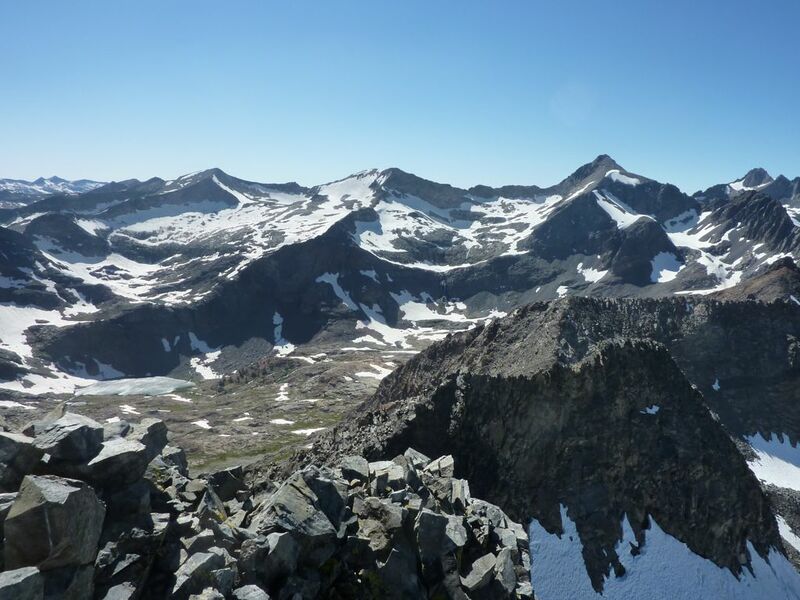 However, the approach to these difficulties was all nice slabs and grass, so I went blithely on, hoping that I would find some way onto the south ridge once I got there. 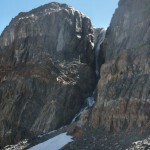 As it turned out, the chute just south of the summit is class 2, and Davis’s southwest face is enjoyable class 3-4. 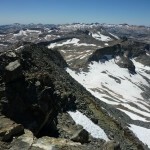 I took the latter most of the way, then traversed over to the easy southeast slope near the summit, reaching it 9h30 from the trailhead. 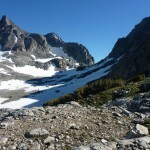 Sitting there with map in hand, I realized that it might be faster to drop down to Thousand Island Lake and work my way through the trail-maze around Agnew Pass, rather than dropping to Davis Lakes and retracing my steps. 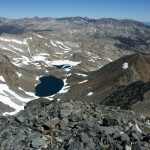 With the sinking sun, I would be forced to take the class 3-4 ridge down to the lakes, rather than the hardening snow, and while the ridge looked like a fun climb, it would be a tiring descent. Plus, I could see more new territory going the Thousand Island way. Either way, I was expecting some headlamp time. 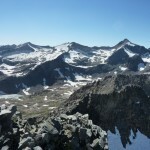 So I headed off along the plateau to the southeast, toward Ritter, Banner, and North Glacier Pass. However, I thought to save some time by cutting through an earlier gap. 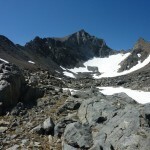 Some 3rd class rock got me to an east-facing snowfield, which was steep and hardening, but just soft enough to kick steps. 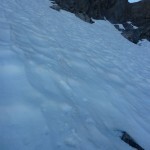 Two sharp rocks in hand, I cautiously chipped and kicked my way down to where the snow was flat and soft enough to ski. 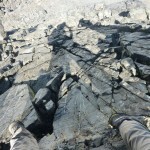 But my self-imposed troubles were not over: on a beeline for the north shore of the lake, my nice slabs turned cliff-ish. 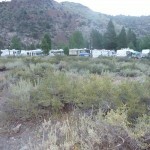 Fortunately, I was once again able to find a class 3-4 way through, and picked up the well-traveled trail near the lake. Looking south, I saw that North Glacier Pass may have been faster. 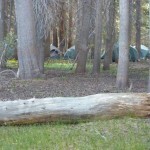 Thousand Island Lake was mobbed with campers, none particularly outgoing, including one particularly inconsiderate one with a madly barking dog. 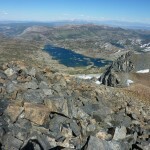 Clearly, I was close to the John Muir Trail. 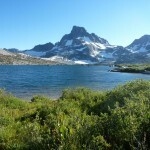 At the JMT junction, some guys asked me if there were any campsites left along the lake. I looked at the flat, grassy fields all around, and wasn’t quite sure how to answer. I still had enough energy to jog the downhills and most of the flats as I negotiated the trail maze, stopping at every intersection to pull out my map. 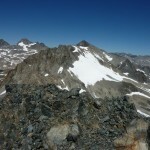 Did I want to go toward Agnew Pass? Agnew Lake? Agnew Meadows? 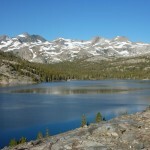 Clark Lakes? 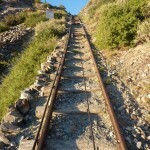 This route crossed more rolling hills than the trail north of Gem and WAAAUGH! Lakes, but seemed shorter. After switchbacking down to Agnew Lake, I crossed a nice new wood bridge below the dam, and rejoined the way out right at the cable car tracks. Much to my satisfaction, I reached the car a bit before dusk, 13h15 out. 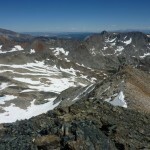 3 peaks, 19.5 miles of trail, ~8000 feet climbed, 0 headlamp — a good day. Not sure, but I haven’t seen a car either time up that trail.